I am Clarence Francisco, a NICU Nurse by a profession and a lover of arts. I am a Filipino and currently living in the beautiful city of Dublin. 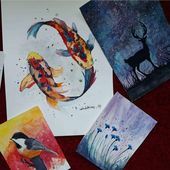 I am a self taught artists and since I do not attend any art class, I do arts based on my own perception and just enjoy every strokes of my brush until I finish my works. I do arts to relieve stress and tiredness from long time hours of work. It renews my energy and positivity which makes me more optimistic in life. Art therapy is really efficient so I hope many more people will love and appreciate arts. Since I want to spread positivity, all my artworks are vibrant and colorful so they will feel joyful, calm and relax everytime they will see my works. Apart from sketching and paintings, I am also fond of capturing scenery and nature. With this, I realized more how beautiful our Mother Earth is and we need to preserve it for the future generations.